Today I will be reviewing my first OPI Infinite Shine Gel Effects Lacquer System! I was sent for review, a box of the Infinite Shine colors and the base and top coat from Preen.me as part of their VIP program. This will really be my first time trying one these new pseudo-gel lacquer type systems. Shall we just get past all the formalities and onto the polish?! Let’s go! To use these polishes you will need to buy into the 1-2-3 Gel Effects Lacquer System with the primer base and gloss top coat (that cures in natural light). The primer base applied fine and dried pretty quick! Always nice. For my base color I chose Set in Stone. A dark taupe that has hints of purple to it, it reminds me a lot of OPI I Sao Paulo Over There. I held them next to each other and Set in Stone may be just a little darker but very close. This was a very pigmented polish, almost covered completely in 1 coat. It wasn’t thin or thick, just kind of that perfect consistency that makes it very easy to coat the nail and not flood the cuticles. I would say the formula is slightly thicker than regular OPI polish and it has a stronger smell. Nothing I couldn’t handle just wanted to note it. I used 2 coats here, it dried pretty shiny and pretty fast! Defintely faster than regular OPI polish. I left my base to dry without top coat so that I could add some stamping. This beige neutral is Maintaining My Sand-ity. It’s a medium sand beige that has just a hint of green to it. I compared it to OPI My Vampire is Buff and it is 1-2 shades darker with a little more of that hint of green/brown to it. This one was a little thinner than Set in Stone. I used it as an accent nail base on my Cindy hand to test opacity and it was completely opaque in 2 coats. This also dried fast and shiny. I stamped with Maintaining My Sand-ity using using Qgirl 026 stamping plate. I used the same plate and Rica Polish Black Out over. Here are a couple of macros to better see the color. 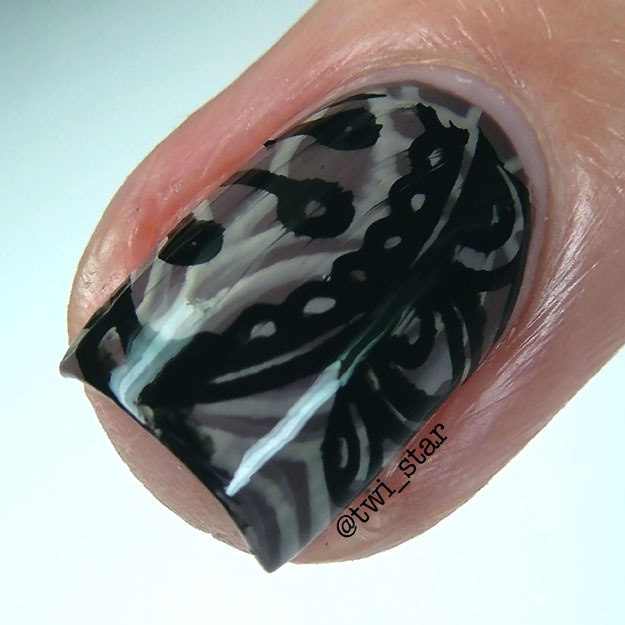 You can see how the Gloss top coat smeared my stamping. I had a feeling it would since mixing different brands of top coat and stamping tends to do that. It wasn’t as noticeable in person The Gloss top coat did dry pretty fast considering I don’t think they are marketing this as quick dry, not as quick as a traditional quick dry like Seche Vite but I’d say my nails were set and smudge-proof in 20 mins and completely dry in 1 hr. To me that is better than when I use regular polish and non-quick dry top coat. On my Cindy hand I didn’t do any nail art and just did 2 layers of color and then top coat. I may have applied the gloss top coat too quickly as it did that weird wrinkle line-y thing almost like little cracks? But on my swatch hand that I allowed the base to dry I did not get the lines. The top coat is actually very very shiny, more so than the regular OPI top coat. 2 thumbs up for shine! Regarding wear time, I can’t really comment on that as I typically wear my manis for 1 day. This claims to provide mirror like shine for up to 10 days. It does seem like it will be long wearing but 10 days is hard to believe. But who knows stranger things have happened haha! If I find myself going away for a long weekend, which I will be next month, I may put these to the test! Thanks for stopping by!